« Meta Cookie » is the world’s first pseudo-gustation system which induces cross-modal effect to let humans perceive various tastes without changing chemical substances by changing only visual and olfactory information. Our system evokes cross-modal effect among vision, olfaction and gustation and let users feel that they are eating a flavored cookie although they are just eating a plain cookie with an AR marker. Gustatory information has rarely been studied in relation to computers, even though there are lots of studies on visual, auditory, haptic and olfactory information. This scarcity of research on gustatory information has several reasons. One reason is that gustatory sensation is based on chemical signals, whose functions have not been fully understood yet. Another reason is that perception of gustatory sensation is affected by other factors, such as vision, olfaction, thermal sensation, and memories. Thus, complexity of cognition mechanism for gustatory sensation as described above makes it difficult to build up a gustatory display. Our research utilizes the complexity of cognition mechanism for gustatory sensation, in order to create a pseudo-gustatory display, which induces cross-modal effect by presenting texture and scent. 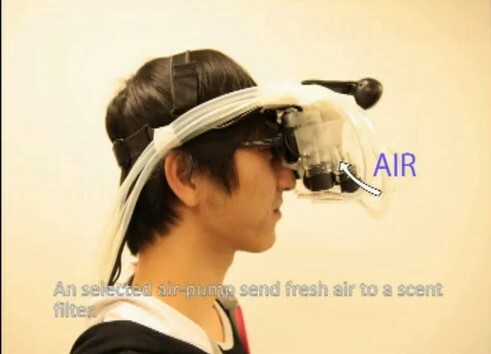 « Meta Cookie » combines augmented reality technology and olfactory display technology. Merging of these two technologies creates a revolutionary interactive gustatory display. With this breakthrough combination of technology, we realize a novel gustatory display system. Pseudo-gustatory display is a novel concept to deal with gustatory information in the area of interactive techniques and open up a new horizon for computer human interaction. Un appareillage qui consiste à leurrer le cerveau en présentant visuellement un cookie au parfum que l’on veut. Des odeurs artificielles viennent parfaire le stratagème et c’est ainsi que vient de naître le premier en cookie en réalité augmentée.